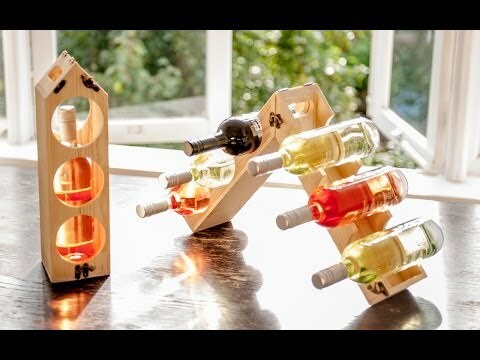 A wooden gift box for wine that turns into a wine rack that can hold up to 12 bottles of wine. Dimensions: 15.75" x 4.5" x 4.5"
Best way to "wrap" wine as a gift and once given the functionality keeps on giving. This gift was given to a Retirement Party host and filled with wines. It WOWED everyone. Going to a party? Need a gift? Wine is always welcome. In this box its more than welcome. It was a hit at the XMAS Party elephant gift! Everyone thought it was very innovative and original!!! 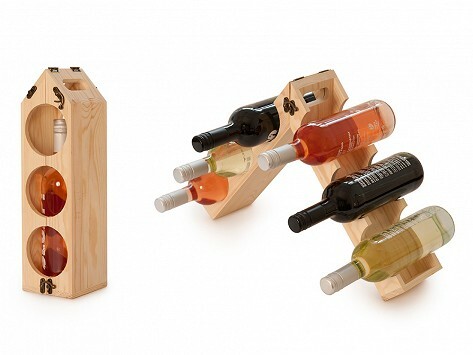 Reminiscent of a wooden birdhouse, the Rackpack is a wine box and storage rack in one. Made of pine by an Amsterdam-based design group called KnowIdea, the Rackpack makes a great alternative to wine gift bags. In addition to helping your bottle stand apart from other host and hostess gifts, the Rackpack can be transformed from a carrier to a wooden wine rack with the simple flip of a few hinges. It can be reconfigured several different ways for storing three, six, or even 12 bottles of wine.